This recording features some Mallet Band stalwarts, including myself, Michael Hatfield, along with Tommy Kesecker, Tom Miller, Jim Munzenrider and Curt Moore. 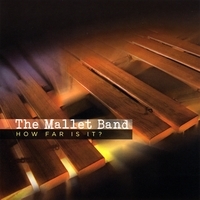 The Mallet Band's latest recording came about in a very revolutionary way. Hatfield called up the guys, said "We're making a record, everybody write something so we don't have to pay royalties." So everyone got busy writing fresh copy or fixing up old original tunes that were homeless. Why is it serendipitous that the tune "tres nicoise" is on the CD? Uh, Tom Miller hadn't titled his tune, we recorded it, went out to lunch, and discovered we had all ordered the Nicoise Salad. Well, at least three of us did. Hence, the title. Total synchronicity, that's the Mallet Band. What's up with the tune "mallette tango"? I wanted some sort of a tango on the CD and scoured the 'net to see if "mallette" actually meant something. Not really.